RC Helicopters at Red Rocket Hobby Shop. We stock a variety of Rc Helicopter aircraft including popular electric models and gas arf kits. 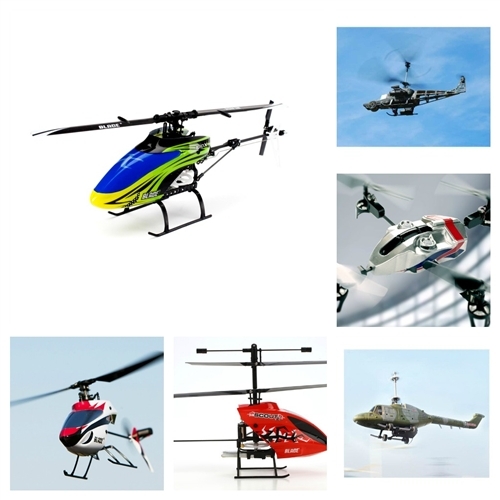 To shop for an rc helicopter browse by manufacturer above. Below is a complete list of all rc helicopter products and parts. Here’s some terminology you might not be familiar with. RTF – Ready to Fly means the kit is fully assembled (some minor assembly might be required) and that everything you need to fly is in the box. BNF – Bind-N-Fly means the kit is just like a Ready to Fly, but does not include a transmitter. The reason for this is so that you can select a high quality radio, and use it on many different models rather than buy a new radio each time. If you need help picking a radio for a BNF please let us know. FPV – (First Person View) is an all-new feature in radio control! Why is it so cool? A camera is included in the helicopter that transmits live video back to your radio so you can see what your helicopter sees, just like you were in the cockpit. Join the FPV Revolution today! The new Mini UFP flying ball copter is durable, safe and most importantly, awesome to fly! The new CSRC flying ball copter is durable, safe and most importantly, awesome to fly! Engineered by experts in RC heli performance. The amazing Blade Scout CX may only weigh a little over half an ounce (17 grams) but it will have you flying circles around other helis like it. The CX-200 Co-Axial (Dual Rotor) helicopter from Hobby People is the perfect way to get helicopter flying right now! The iPhone Controlled Ultra Micro Heli that you control with your iPhone Device! Includes gyro for super stable flight. The new v911 4 channel fixed pitch helicopter comes equipped with a 2.4ghz transmitter so you can bring the fun outdoors! The Traxxas� QR-1� is the easy way to experience acrobatic flying thrills and high-speed airborne excitement. Fast, Stable, and Easy to Fly! Blade raises the bar yet again with the mSR X; the world�s first fixed-pitch ultra micro heli with advanced AS3X� flybarless stabilization.